Peace Boat will visit New York City again as part of the 95th Global Voyage. 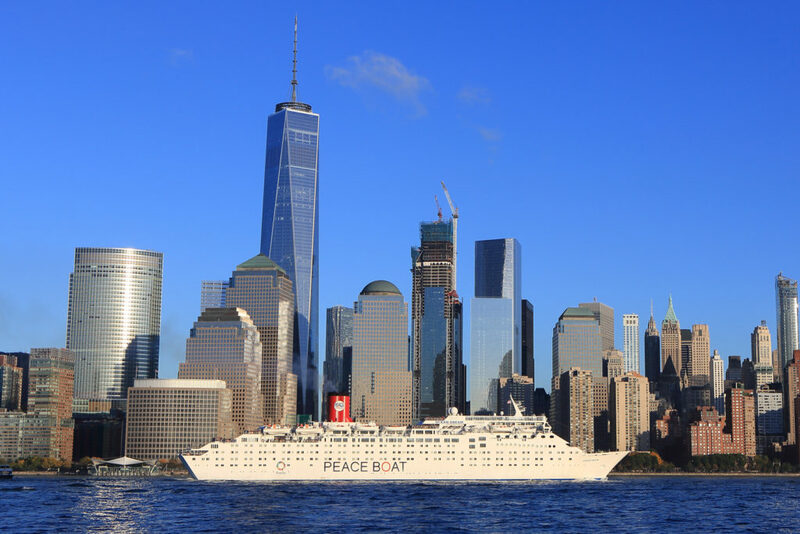 The world’s largest passenger ship sailing around the world for peace, sustainability and innovation will visit New York City on October 15-16, as part of Peace Boat’s 95th Global Voyage for Peace. Over the two days, a series of activities will be held including events at the United Nations and study and exchange programs with local New York City community groups. As a highlight and to celebrate Peace Boat’s return to New York, the NGO will organize for the second consecutive year a “Floating Festival for Sustainability”. The festival will take place on the evening of Sunday, October 15 while the ship is docked in Manhattan. The “Floating Festival for Sustainability“ will include dynamic presentations, music, exhibitions, cultural performances and more, focused on the UN Sustainable Development Goals (SDGs) – in particular oceans and climate action. A group of young people from Small Island Developing States affected by climate change will also be traveling onboard the 95th Voyage. These young men and women between the ages of 19-26 are from the regions of the Pacific Ocean, Indian Ocean, and the Caribbean. They are leaders in their communities and have extensive experience in the struggle against climate change and ocean degradation both locally and internationally. The group will embark upon the 95th Global Voyage in Barcelona on September 22, 2017, and visit five ports in Europe before reaching New York to share their message with both the United Nations community and the broader public. Floating Festival for Sustainability onboard Peace Boat, featuring presentations by the Ocean and Climate Youth Ambassadors, live music, art, fashion and more. Presentation of Ecoship, the world’s greenest cruise ship by Peace Boat Founder and Director, Yoshioka Tatsuya. Peace Boat side-events at the United Nations, including testimony by survivor of the atomic bombing of Nagasaki and appeal regarding the Treaty to Ban Nuclear Weapons. Local exchange and study programs with community organizations including Global Kids. Please note that registration in advance is strictly required in order to visit the ship or attend onboard events. Contact us for further information about Peace Boat and opportunities for coverage of its programs in New York City.